I will be the voice behind you, guiding you in the way you should go. Have you ever come to a fork in a road and not sure which road to take? I know that often when I have gone hiking, there inevitably comes a time on the trail where it splits off to the right and then left and I am not always sure which path to take. Wouldn't it be nice if at that exact moment, you had a trail guide standing behind whispering in your ear what to do? 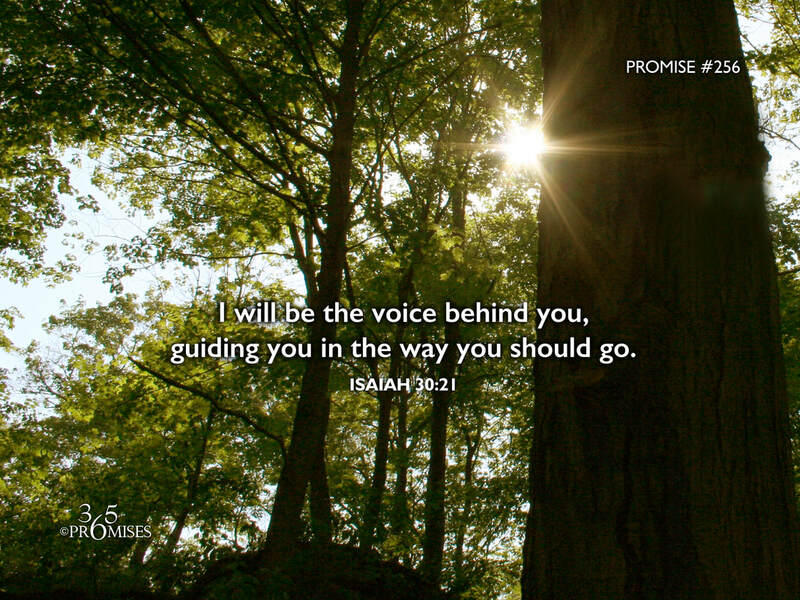 In today's Bible promise, God is saying that He is right behind us and He will tell us the way we should go. What a comforting thought to know that we are not left on our own to figure things out. God has committed to walk with us and to at times, carry us on our life's journey. Sometimes when I struggle to find my Father's direction, I wonder if it is because there are so many other thoughts swirling around in my brain that I just fail to hear His still small voice? Experts say that we all have tens of thousands of thoughts chattering in our brain on an average day. Perhaps all that noise is drowning out the gentle, quiet whisper of our heavenly Dad who is standing behind us, willing to tell us where we should go if we will only quiet our mind to listen? This is why I think it says in Psalm 46:10 to 'be still and know that I am God'. The next time you need to know what path to take, why not quiet yourself (to the best of your ability) from all the chattering and opinions that swirl in your thought life and listen for the still small voice behind you? God has promised to be there and He has promised to be the voice that will direct you in the way you should go.